During his keynote speech at Sage Summit in July (you can watch it here), Himanshu Palsule, Chief Technology Officer at Sage, announced the launch of a completely modernized web-based version of Sage 300 that they are calling Sage 300c. In this article, we’ll take a closer look at this new technology that’s scheduled to launch with the upcoming release of Sage 300 2016 sometime in October. Sage 300c will feature new HTML-based web interfaces for several modules including General Ledger, Accounts Payable, Accounts Receivable, Bank, Tax, Common Services, and Administrative Services screens. The operations modules like Inventory Control, Order Entry, and Purchase Order will follow shortly after, sometime in early 2016 as part of a product update. Because they are web-based, these new screens will run in all of the main internet browsers including Chrome, Firefox, Internet Explorer, Edge, and Safari. That also means you can access and use them on a wider variety of computers and devices including Macs, Windows desktops and laptops, iPads, and Android Tablets. While these new screens will work on smaller mobile devices, the design isn’t fully mobile-responsive just yet so there is a fair amount of scrolling required. Sage says that fully mobile-responsive screens are still a version or two away. 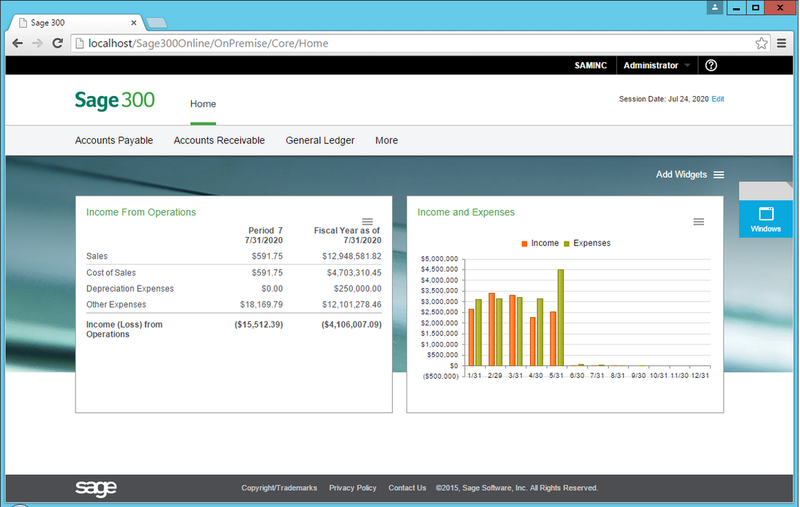 Sage 300c will introduce a new customizable Home Page that’s similar to your traditional Sage 300 desktop. This is where you’ll find the main menu and other useful functions. Since you’re already familiar with Sage 300, you’ll pick up the new screens quickly because it’s the same application that’s simply re-imagined to fit a modern web environment. While all of your familiar elements and functions are still there, you’ll discover that the controls aren’t packed together as closely as the classic screens. That makes it easier to touch fields and buttons with your fingers rather than relying on the fine-tuned precision of a mouse. Upgrading to Sage 300 2016 doesn’t mean you’ll be forced to use the new web-based screens. You can still use the traditional screens or a combination of both. With the initial release, customization of the web interface is not supported. But a customization toolkit will be made available in a later release. Stay tuned for more details or contact us with your questions. Contact us if you have questions about Sage 300c and how to deploy it in your Sage 300 ERP environment.